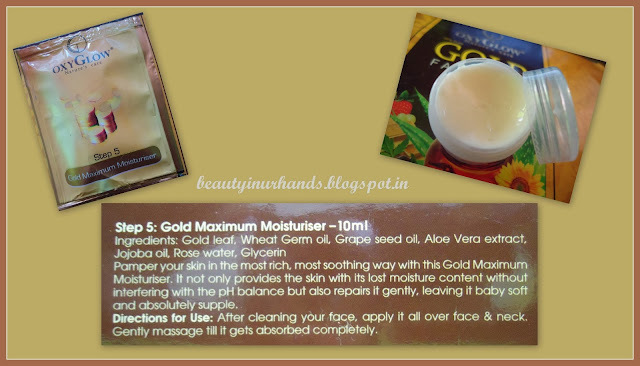 Gold is known to be one of the softest metals, which is readily absorbed by skin. It cleans off the impurities and dirt by penetrating the skin and has revitalizing and rejuvenating effects. 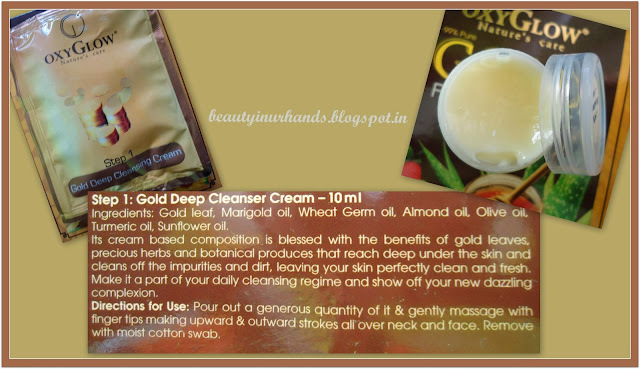 It also helps in improving blood circulation and enhancing skin elasticity. 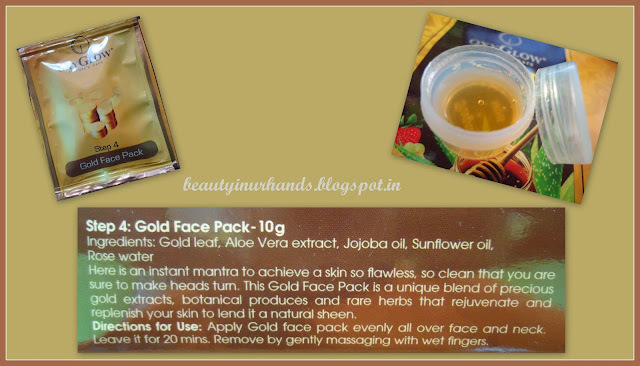 The concept of Gold Facial is deemed to be based on natural herbs and acts as a powerful anti-ageing treatment. 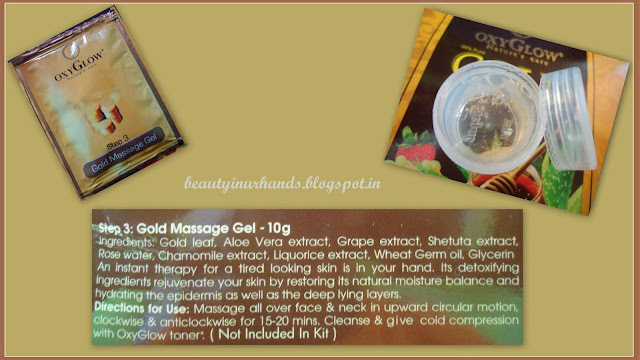 So for a sparkling smooth skin, without wrinkles, check out the OXYGLOW Gold Facial. This cleanser cream has a thick consistency and smells really nice. It is a bit difficult to wash off and takes some time. It effectively removes all dirt and oil. This cleanser did dry up my skin nor did I feel the urge to moisturize. This is a gel based scrub and smells wonderful. 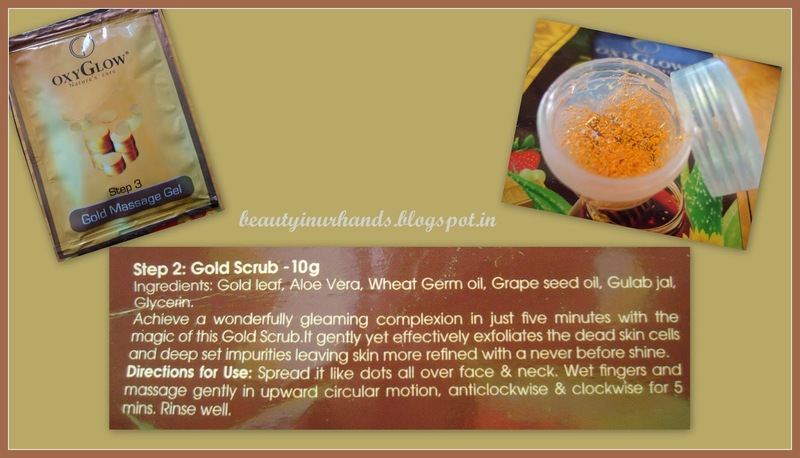 It contains numerous beads which are gentle yet effective. After massaging and washing it off, my skin looks cleaner and brighter. This is one of the best scrub I've ever come across. After using a scrub, it is very important to moisturize the skin. This gel does a good job of hydrating my skin. It does not give a sticky feel to my skin. This is a nice massage gel. This face pack has to be applied evenly and left over for around 20 minutes. Now removing this face pack is a pain! After it dries up, you need to remove it by massaging it with wet fingers. This process is time consuming. I used this face pack just once. Later on I used the Attitude Face Masque instead of this one. I don't like this moisturizer as it makes my already oily skin all the more greasy. I use very little quantity during this facial. Dry skinned people will love this. 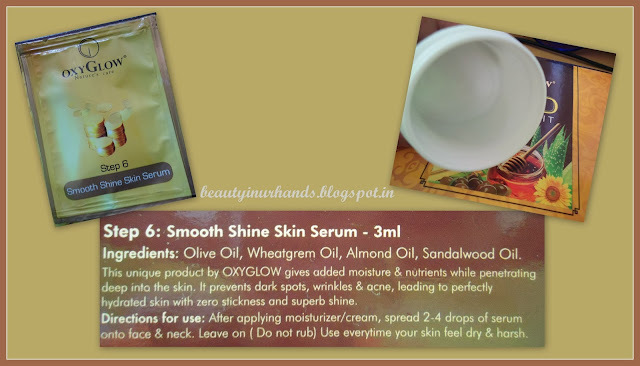 You just have to spread this serum on the face and not rub it onto the skin. It penetrates slowly into the skin. I prefer applying this serum everyday before going to bed. This serum has shown fast results in the sense, my skin feels smooth and soft. This serum is ideal for those having dry patches or dry skin. I use this spoon to take out each product to avoid any contamination. In conclusion, I would recommend this kit for those of you having dry skin. The others can also try it out though. This kit does a good job in making my skin soft and smooth. At a price of just 175 INR, this kit is cost effective. It lasted me for 5 uses. I dislike the packaging though. I emptied the sachets into small tubs which I had kept from my previous facial kit. This facial kit also had a 20 ml sample sized Neem and Tulsi Face wash. I gave it to my brother as I already own many face washes. 1. I don't like the sachet packaging. I would prefer small tubs. i just bought this package. they have shown golden coloured tubes types of things but they sent low quality black coloured round box.